Trip planning is an exciting and overwhelming time for many people. Luckily – we are here to help! How important are amenities such as a fitness room, free breakfast, and having your bed made and towels cleaned every day? Do you want to feel like a traveler or like a local? Is saving money or optimizing comfort your top priority? How much space do you need – multiple bedrooms with full kitchen, multiple bathrooms, and living space? Or a hotel room or suite? Is this trip with friends or family? Once you know what your priorities are for your particular trip, you’ll be ready to decide where to stay. 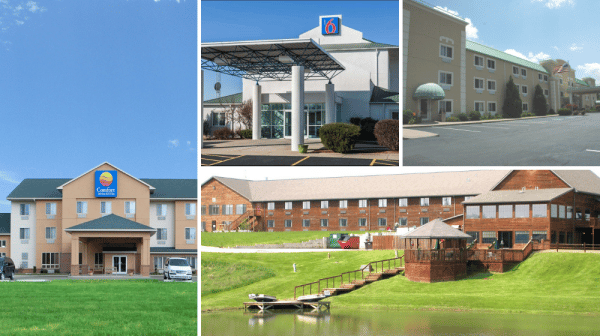 But first, here are five of the hotels and motels located near Santa Claus, Indiana, and sites throughout Lincoln’s Indiana Boyhood Home. This family-friendly hotel features an indoor pool and hot continental breakfast served daily. Some nearby restaurants include Denny’s, Wendy’s, and Los Dos Charros. Baymont Inn & Suites is only 10 minutes from Santa Claus, Indiana. This hotel is a convenient place to stay for business travelers and families. Hotel guests may enjoy a free hot breakfast, free Wi-Fi, fitness center, indoor heated pool, and all rooms feature coffee makers, hair dryers, irons with ironing boards, and TVs. And, select suites include microwaves and refrigerators. Comfort Inn & Suites is only 20 minutes from Santa Claus, Indiana. This motel includes free Wi-Fi and an outdoor pool, with a microwave and refrigerator in each room. Truck parking is available. Pets are welcome. Motel 6 is only 10 minutes from Santa Claus, Indiana. This family-friendly hotel is located less than a mile from Holiday World & Splashin’ Safari. This is a convenient option with a restaurant on site along with Santa’s Express Ziplines. The general amenities include cable TV, a whirlpool indoor pool, playground, Wi-Fi, laundry facilities, and more. There are also several meeting spaces for large family reunions or small meetings. This budget-friendly motel includes an outdoor heated pool and free Wi-Fi. Stones Motel is located only 10 minutes from Santa Claus, Indiana. You can’t go wrong with any of these six hotels and motels. Discover a full list of lodging options here.